An arm with some nice juicy veins. If you are not blessed with one, borrow someone else's. A couple of fingers, not attached to the arm you are using. 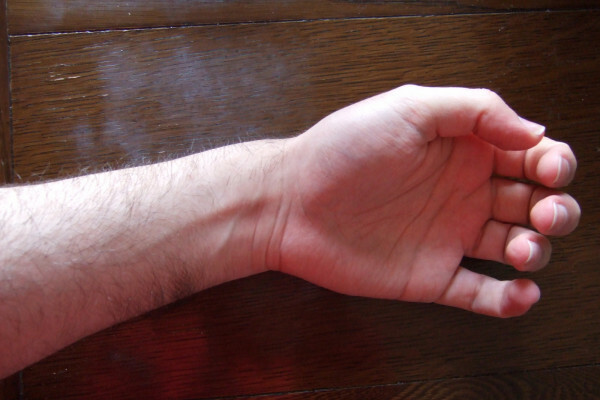 Push your two fingers onto the vein at the hand end. Slide the finger closest to your body along the vein, while keeping the other finger still. This should squash the blood out of the vein. Lift one finger, then the other. Do the same process but lift your fingers in the other order. You should find that if you lift your body side finger first the vein will not refill, but if you release the finger closest to your hand the vein should refill quickly. near infra-red camera because this makes the blood in the veins much more obvious. This is an experiment made famous by William Harvey in the 17th century, he was the doctor to King Charles the first, and did some of the first quantitative medical research. Up until this point doctors followed a theory put by the Greek doctor Galen who thought that there were two types of blood in the body, arterial blood which was made in the lungs and moved out to the rest of the body along arteries, and venus blood that was made in the liver and travelled out to the body along veins. The experiment which you have just done showed that this could not be the case, because you have shown that the blood is flowing from your hand towards your body, the opposite direction to what Galen thought. What Harvey worked out was that blood moves from your heart out to your body along arteries and then returns along the veins. One of the reasons this had not been realised before is that blood flows from arteries to veins through microscopic blood vessels called capillaries. The effect is even stronger than this, because your veins have a series of valves to stop the blood flowing backwards in between heart beats, thus making your heart's job a lot easier. William Harvey did lots of other research to convince other people of his theories, for example he worked out that the heart pumped at least 250kg of blood a day (an inconceivable amount then and a deliberate underestimate - the real number is nearer 7000kg). This is, of course, far more than your total weight which made Galen's theory even more unlikely. This was so cool! It was hard to see on my darker skin though.